Dubbed the SdKfz 302 (Sonderkrafahzeug, German for special-purpose vehicle) but better known as the Leichter Ladungsträger (light charge carrier) to its Nazi operators and the Goliath to the Allies, this unique weapon of war was first developed in occupied France in 1940 by French vehicle designer Adolphe Kégresse. Upon learning that the Germans had taken an interest in his vehicle, Kégresse (not unlike Bugatti) attempted to hide his prototype from the Nazis by sinking it in the Seine river. Unfortunately, officials from the Wehrmacht (the German Department of Homeland Security) were able to recover the prototype and had German automaker Carl F W Borgwand put it into production. The Goliath stood a foot tall, four feet long, and could carry anywhere from 50 to 100 kg of explosives. 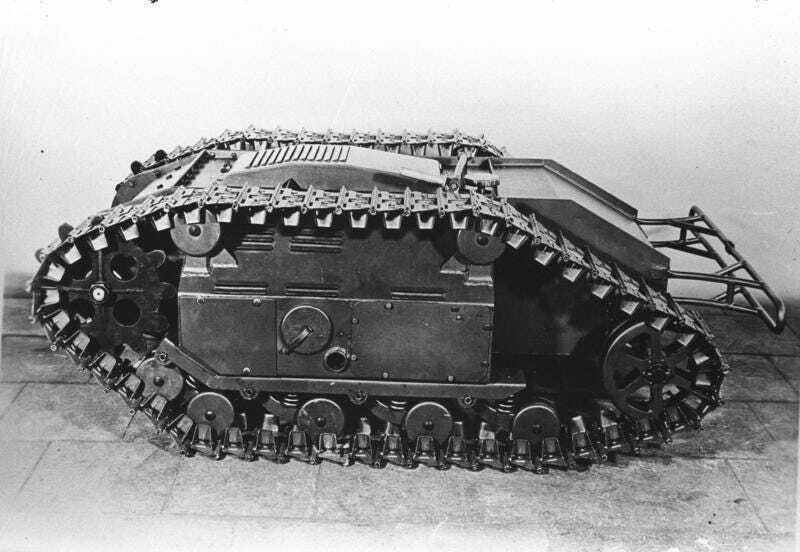 Its tracks allowed the remotely operated vehicle to scale the walls of trenches and battlefields but slowed its top speed to just 6 mph. It was controlled via joysticks connected by three 2,130 foot-long cables—one each for steering, throttle, and load detonation. The Goliaths were originally equipped with electric motors when they made their battlefield debuts in 1942 across the European theater—finding extensive use with Panzer and combat engineering units. However at 3000 Reichsmarks a pop, these motors proved far too expensive and maintenance intensive for use in what was essentially a remote controlled wheelbarrow filled with dynamite. As such, the electric motor was quickly swapped out for a cheaper, simpler, and far louder gas engine. This turned out to be a boon for Allied forces. With the loud puttering of a gas engine, Allied forces could easily locate the Goliaths before they found their way to their targets then deactivate them simply by cutting the control wires. The Polish resistance employed this tactic to great effect during the Warsaw Uprising of 1944 while the Americans that faced these diabolical devices at Normandy deactivated them with the help of concentrated off-shore artillery barrages.